Home » Articles » Aircraft » Easy Going Prowlers…. 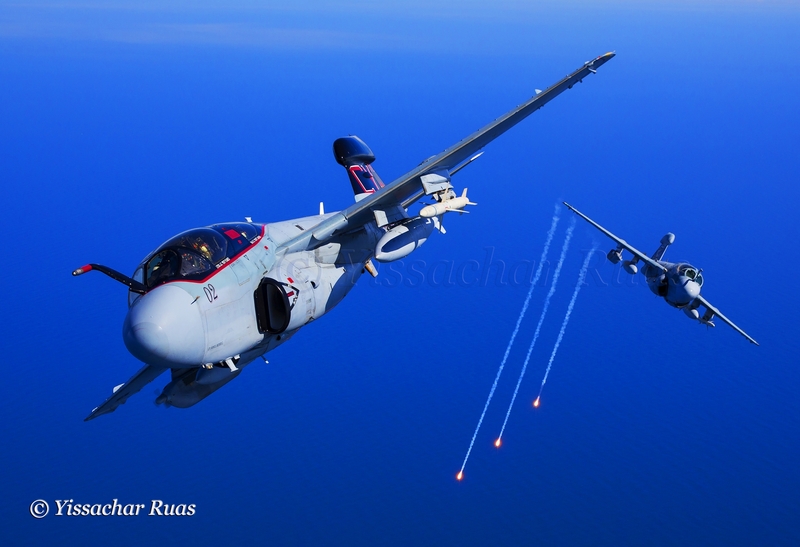 On March 14 the last EA-6B Prowler from VMAQ-2 “Death Jesters” took off from MCAS Cherry Point en route to Dulles International Airport. Q-2’s Squadron bird was to make its final flight, sealing over 40 years of flying the skies all over the World. It was a fitting end to a unique career, the uniquely painted Prowler is to be put on display in the Smithsonian Air and Space Museum. 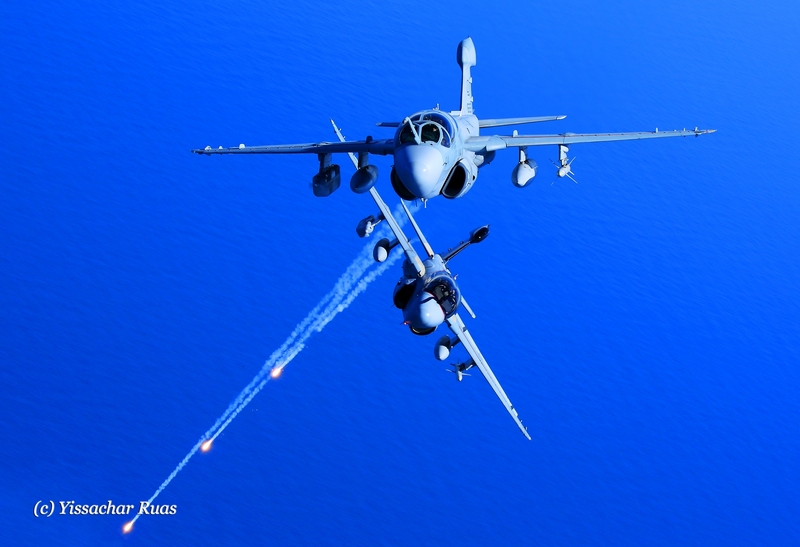 Preceding its final flight were several months of preparation as Prowler operations came to a close. Q-2 returned from a combat deployment to the Middle East, finishing where it’s needed most – supporting U.S.-Coalition ground troops in need of using its special suite of Electronic Warfare to counter enemy operations. Q-2’s deployed its 6 aircraft to Qatar in support of operations within CENTCOM. According to Q-2’s maintainers the “Death Jesters” achieved a 75% readiness rate while deployed. This is a tribute to both the maintainers as well as strategic planning by choosing more reliable airframes from decommissioned squadrons. The deployment accentuated the fact that the Prowler’s unique platform will be missed, the US DoD will be pressed in the coming years to provide a suitable replacement for many of the Prowler’s capabilities. While US Navy EA-18G Growlers share many capabilities, the USMC will look towards platforms such as the F-35 as well as UAVs to fill the gap. Preceding the deactivation ceremony on March 8th a final photo flight was conducted with Q-2s remaining Prowlers – this was also the type’s last operational flight. Among the the crew aboard the flight were Q-2’s CO Lt Col. Andrew “Grundy” Rundle and it’s XO Major Julian “Pico” Flores”. 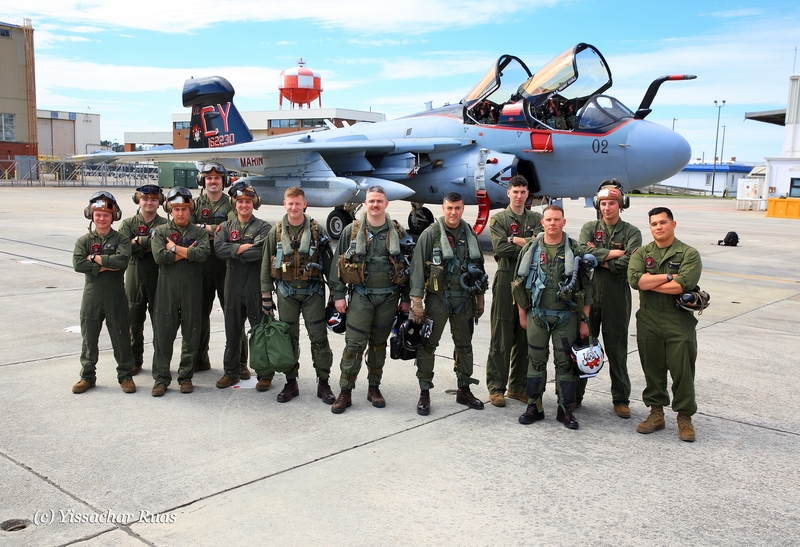 Leading the historic flight was a VMGR 252 “Team Otis” KC-130 squadron bird piloted by Otis’s Commanding Officer Lt Col. Benjamin Grant and Lt. Zachary Weinbaum. Both of Q-2’s last Prowlers conducted an AAR mission for the last time. Lt Col.s Flores and Rundle were on the type’s last ferry flight to the Smithsonian as well the following week. The lives of the maintainers of the type the past few years have actually been easier going with regards to keeping the last Prowlers in the air. Following the decommissioning of the type in the Navy and as various USMC squadrons retired getting parts was easier to come by. According to Chief Warrant Officer Hamilton of Q-2 “once an order for a part, be it a rudder pack, a flight control surface or an engine, once a document was issued, the parts were processed for shipping with immediately since there was no competition for the parts compared to 20 years ago”. According to Gunnery Sgt Randell what also makes the process easier is the continuity of personnel within the supply chain. He added “it helped that decisions made well above our pay grade to allow us to retain the newer airframes, so Chief Hamilton and I worked now on younger airframes than we had worked on when starting out 18 years ago”. Adding to that Maj. Brad “Chef” Erdel added “As the drawdown of the Prowler squadrons progressed among those Marine maintainers who are the backbone of the platform were the ones who had a great deal of experience on the platform, with many having transitioned from within the Prowler community”. Chief Hamilton added that the division heads for departments such as avionics and airframes were handpicked from Q-3 and Q-4 as they were shutting down so as to provide a winning team for Q-2 until the very end. For all maintainers they wont be missing “panel parties” as they are called when it comes to unscrewing parts but they will miss the comradery that comes with serving in such a tight cohesive unit. 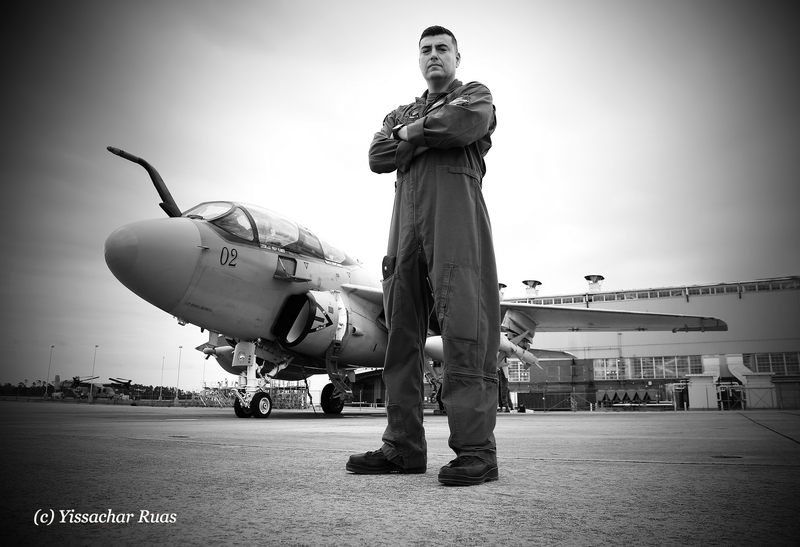 For Lt Col. Julian “Pico” Flores Q-2’s Executive Officer being utilized until the very end was one of the most important tributes to the aircraft. “It showed just how important our mission Airborne Electronic Attack is”. For Lt Col. Andrew “Grundy” Rundle, Commanding Officer of the “Death Jesters” “it’s the coolest thing to fly this aircraft, it’s a real plane, not to take away from any of the other Marine aircraft, but this aircraft is heavy, its loud, it’s a cool piece of gear”. 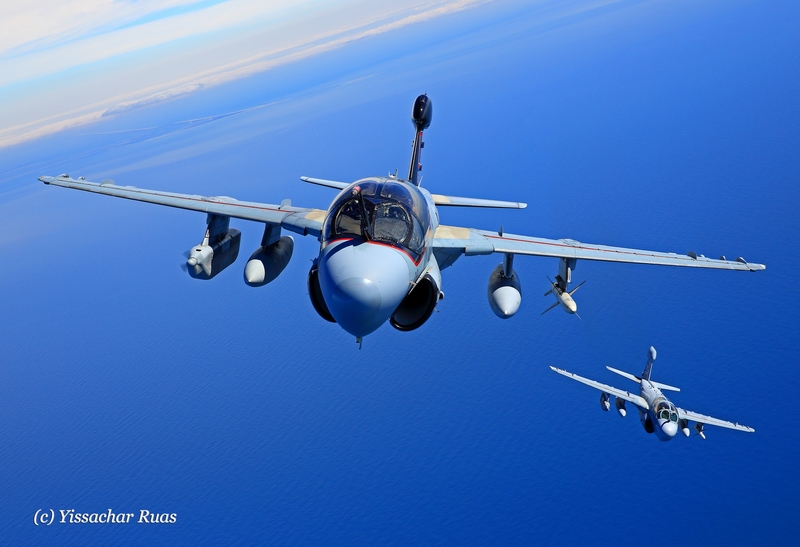 As an “ECMO” (Electronic Warfare Officer) by trade Lt Col Rundle chose Prowlers over Hornets during flight school feeling he would be better utilized and has been flying them since 2002. His most memorable moment was getting airborne along with all six Prowlers taking them out to the deployment and bringing the whole squadron back safely from a combat zone. Lt Col. Rundle is looking to contribute to Electronic Attack in other areas as he moves forward, his message to the Men and Women of the “Jesters” is is just how proud he is of his Marines “I am profoundly grateful of being able to be your Commanding Officer during this time, you rose above all the distractions of being the last Prowler Squadron and performed flawlessly until the very end. We got the job done and that is credit to all of you regardless of rank and position”. For many of the Marines this is the end of an era, but Electronic Attack has never been more important, the “Jesters” leave a legacy behind that will be hard to compete with. 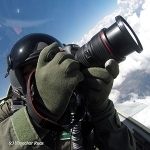 Yissachar Ruas was born in NYC, shoots world wide commercially, with a special interest in Military Aviation. Yissachar has shot numerous projects for the Israeli Air Force including yearly projects for its Display Team. Yissachar has had the opportunity to fly with a variety of different air forces including the USMC, Israeli Air Force, NATO alliance nations, embark with the US Navy as well as having flown fast jets with the USAF. 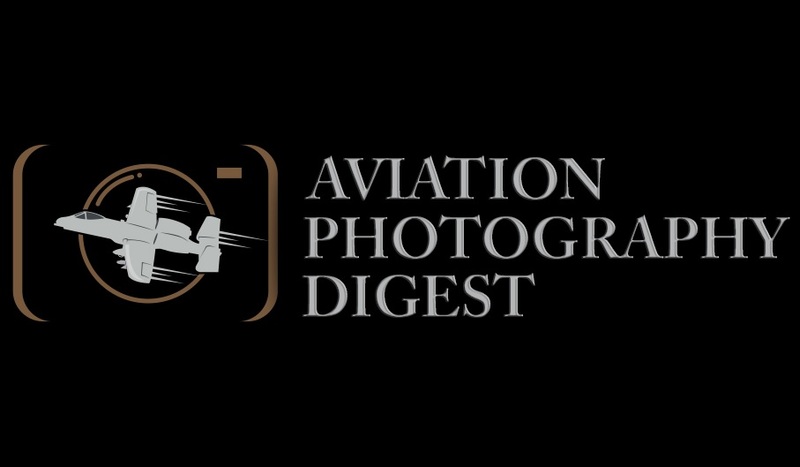 Yissachar shoots Canon since he was given a Canon AE-1 by his mother at the age of 8 years old and progressed by working for many American Wedding Photographers.